Shopping is one of the greatest pastimes in Thailand—the best way to find everything you’ve ever needed, and things you never knew you wanted. Whether you’re visiting the mega malls of Phuket, the floating markets of Pattaya, or the world-renowned tailors of Bangkok—you won’t leave Thailand empty handed! Thailand takes shopping to a whole new level. One look around the Chatuchak markets in Bangkok and you’ll know you have ventured outside of Australia! Explore the expansive weekend market with over 8,000 stall holders offering everything from food to furniture, clothes to jewellery, leather goods, garden sculptures and so much more! 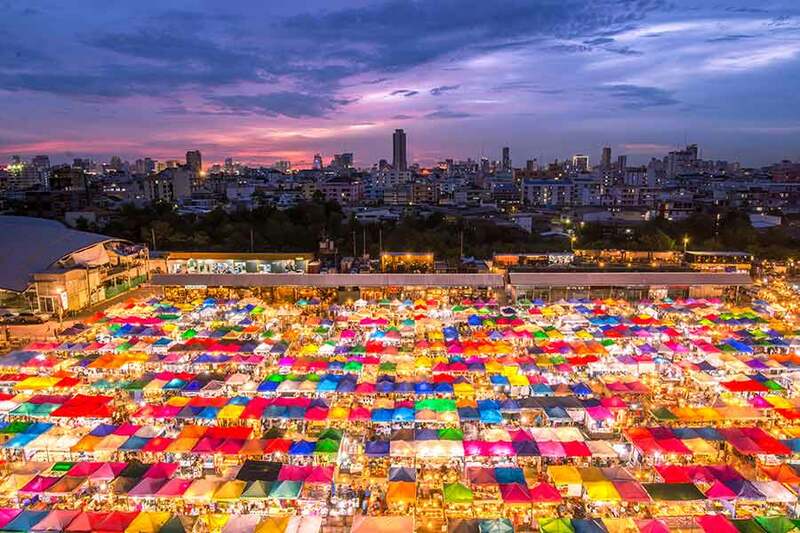 There are impressive markets all over Thailand; whether you visit an open-air market, night market or floating market, make sure to check which days they are open and plan your visit accordingly. Practice your bargaining skills and get lost in the maze of stalls—it’s truly an experience! Though you might pick up a bargain, make sure to check the quality of market items before you buy. If you want to avoid the large crowds and get a feel for more authentic Thai shopping, try some of the smaller local markets, generally found around palaces and temples. On the opposite end of Thailand’s shopping experiences are the high-end malls and designer boutiques located throughout the country. Selling everything from fashion to jewellery and accessories through to art and home décor. The air-conditioned malls are a welcomed break from the midday heat in the open-air markets. As well as high-end malls, Thailand also has several outlet shopping malls including Outlet Mall Pattaya and Premium Outlet Phuket. When shopping in Thailand, you should research which areas are best for the items you want to buy. For instance, Chang Mai is well-known for its magnificent teak furniture and Bangkok has a range of world-renowned tailors able to whip up your new work wardrobe in a matter of hours. Here, you can select the fabric and design of your new suit or dress—all for half the price that you’d pay in Australia. For the best shopping in Phuket, head to the ultra-modern Jungceylon Shopping Mall in Patong, which boasts an upmarket department store, fashion, sunglasses and accessories as well as perfume, electricals and plenty of dining and entertainment options. 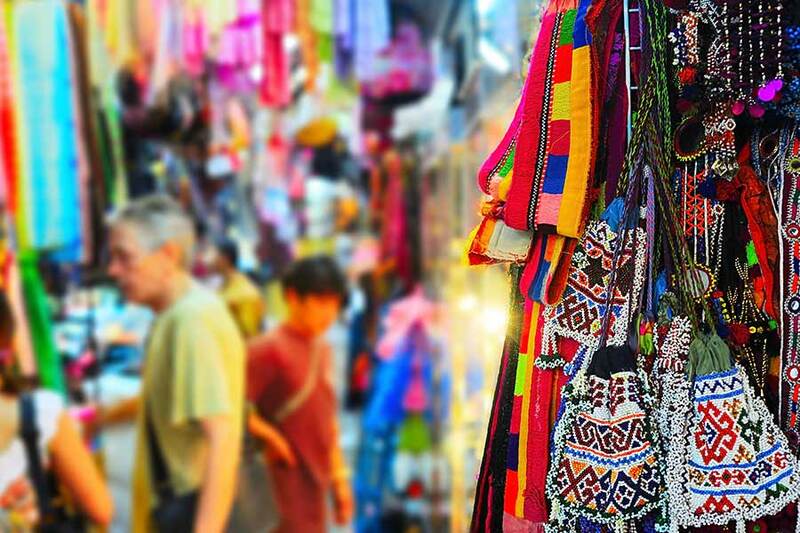 In Phuket Town itself, you will find the popular Chillva Market, Phuket Walking Street markets (Sundays only) and the Weekend Night Market on Chao Fa West Road— just 1-kilometre away from the Central Festival Phuket shopping mall. The markets boast souvenirs, toys, fashion, local handmade items and delicious food. Go for a wander and the sounds and scents wafting through the air will lead the way! If you are staying in Pattaya, head to the beachfront Central Festival shopping centre housing over 300 shops including electricals, Western fashion brands and entertainment. Further down the beach is rival shopping centre Royal Garden Plaza which brags high street fashion, souvenirs, jewellery and much more. For a more traditional Thai shopping experience, head to the Pattaya Floating Market to pick up local handicrafts and see the impressive stilted houses. Need help choosing a resort for your shopping trip in Thailand? Call our Thailand Holiday Experts on 1300 008 424 today!